Enjoy this easy to make, mouth-watering farm to table recipe sure to wow your summer dining guests! You can pick up the fruit from our own Windy Way Farm! Roll out both pie crusts as if making 9″ pies. Place both on parchment lined pan. In a large bowl mix peaches with brown sugar, vanilla, honey, cinnamon and flour. Gently fold blackberries into peach mixture. 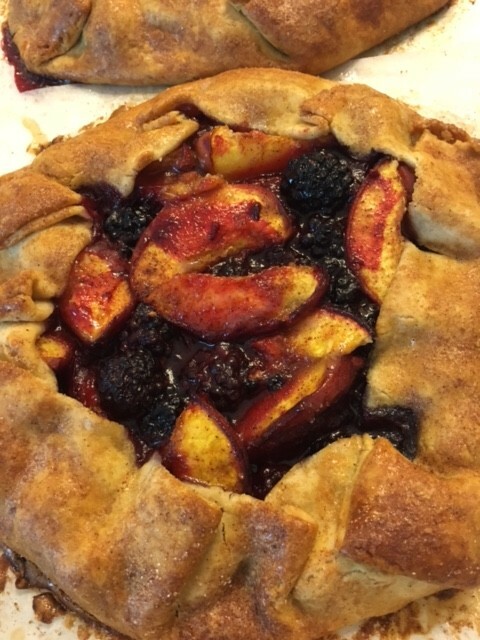 Place 1/2 of the fruit in the middle of each crust. Dot with butter pieces. Fold edges of dough over fruit in a rough pleated pattern. Brush with egg wash. Sprinkle crust with cinnamon sugar. Bake for approximately 1 hour until bubbly and crust is golden brown (juice may run over crust). Cool. Serve with ice cream or whipped cream if desired and enjoy! !